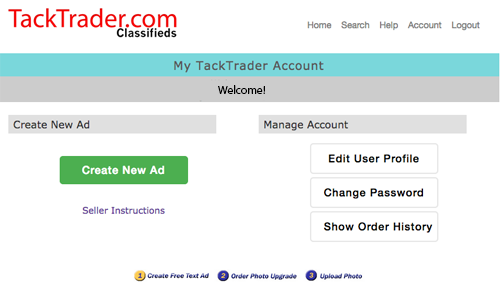 Your TackTrader Account is where you Add and Edit Ads, View Ad Responses, Update User Profile Information, and Order and Upload Photos. Once your text ad is online, you can upgrade to a photo ad. Upgrading to a Photo Ad is very Simple! Our SECURE shopping cart supports Visa, MasterCard, American Express, Discover, PayPal, online check, and postal mail orders. After your order has been completed, please send us your photo. Login to your Account and click the blue Photo/Video button, then select Upload Photos. Very large image files may be sent via our Dropbox. Thank You for Using TackTrader.com!